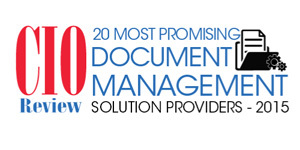 CIO Review has named IntelliChief a Top 20 Most Promising Document Management Solution provider. With document capture, storage, and workflow automation solutions, IntelliChief is a best-in-class product for enterprise-level document management. And, its comprehensive ERP integrations make it one of the most progressive products on the market. Oracle, JD Edwards, SAP, and other technologies are made much easier to use with IntelliChief’s process management workflow features & data automation modules. Other impacting factors in the designation? To learn more about our award-winning products, request a demo or contact IntelliChief today. You’ve heard that it’s possible to capture your business documents electronically. You’ve also heard how much it can improve your workflow. But how does the process work? At IntelliChief, we’ve carefully designed a collection of document management & workflow automation products that sync directly with your ERP. This allows you to achieve major speed and accuracy improvements across your entire organization. And the technology behind those improvements? It all starts with Capture Enterprise, our OCR software that automates the collection of data from your documents. It reads the individual letters and numbers on your paper files, then converts it into machine-readable text. Your content becomes much more usable – with much less effort from your team. Costly and labor-intensive document preparation is put to an end, and the indexed information is sent directly into your workflow streams. Your information is re-purposed throughout your organization, for the fiscal benefit of your business. The front end (Capture Enterprise) takes care of the back end (your ERP). This streamlined approach to document processing is a gateway to workflows that actually “flow”. Keep reading to learn more about the technologies behind IntelliChief Capture Enterprise. Customer service impacts every department of your company. It’s generally accepted that it costs 10 times more to win a new customer than to keep an existing one. Winning customers and then keeping them loyal are critical business requirements. But what keeps customers loyal? As is usual with such questions, the answer is: many things. Price, quality, availability, previous relationship and even just the inertia of staying with a company they’ve dealt with for some time all play a part, though customer service is a decisive factor. Customers need immediate answers to their questions, thoughtful (and proactive) communication, fast shipping, accurate charges on their invoices, and short lead times. In fact, they don’t just need it: they expect it. Are you providing it? If your customer service isn’t measuring up, you may want to look at how information is accessed within your organization. When customer service representatives can’t readily retrieve order numbers, shipping documents, or other information that a customer is looking for, loyalty erodes. The longer customers stay on the phone, waiting for answers, the more annoyed they become. A faster experience is crucial – and providing immediate access to customer service documents is a perfect first step. The IntelliChief Paperless Customer Service whitepaper demonstrates how automating information capture, management and workflow of customer service processes successfuly engages your staff with each of your customers. It also shows you how validating and updating each account’s information and orders documentation with your enterprise resource planning system (ERP) can help you provide better service at every level of your organization. Keep reading to learn more: //bit.ly/1enzegT. Or, keep reading to discover more of IntelliChief’s paperless customer service solutions. Order to cash automation is helping many companies work more effectively. One real-life example? This manufacturer removed paper from their O2C worfklows, which made their entire department more efficient. This order to cash automation case study shows how O2C automation software helped them expedite the fulfillment process – and in turn, significantly increase their profits. As a major player on both the national and international stage, this company immediately made themselves more competitive – and it all started with IntelliChief. Providing your Accounts Payable department with the ability to proactively manage the payment of your outstanding invoices is vital to optimizing your cash flow. Paperless invoice processing can help. Filing and archiving invoices and related documents. You’re likely all too familiar with the costs that paper-based invoice processing adds to your organization. But, you don’t have to keep working them into your budget. IntelliChief can help your Accounts Payable department take control of invoice processing, using effortless automation to streamline your workflows. Contact us today to discover how, or explore our procure to pay solutions here. In the latest release of IntelliChief, users gain a new Workflow System Designer. This new module allows for diagrammed mapping of a company’s unique business processes – including their automated workflows. With Workflow System Designer, it’s easier than ever to customize document and content workflow navigations. You have unique business processes – and IntelliChief can accommodate them. Our business process modeling platform can span multiple users (and departments), making sure anyone who needs to be involved can be. This makes the transition to automated workflow functions faster and more reliable. The business process mapping capability comes with diagram depiction, as well as optimized views that ensure that documents aren’t accidentally omitted from a workflow. The feature can be implemented anywhere you need it – from Accounting and Customer Service to Human Resources, Legal, and Operations. Documents can be captured, indexed, validated with your ERP, and routed through your company with little to no input. The result? Complete confidence that all need-to-know information is properly dispersed throughout an organization. You can say goodbye to paper- and process-intensive operations for good. To learn more about IntelliChief’s enterprise-class automated document management and workflow solutions, contact us today. Or, request a demo of our new Workflow System Designer capabilities.